In the drawing columns, you can see the drawing names and their exposure. You can use any alphanumeric symbol to name your drawing. 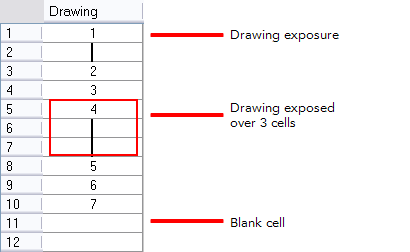 When a drawing is exposed over more than one cell, a vertical black line is displayed to indicate the continuity of the exposure. When there is no drawing in a cell, the cell will be blank.